Headaches are familiar to nearly everyone: in any given year, almost 90% of men and 95% of women have at least one. In the vast majority of cases, however, the pain isn't an omen of some terrible disease. The three most common types of headaches are tension, sinus, and migraine. Other than sinus congestion, most headaches are triggered by stress, fatigue, lack of sleep, hunger, or caffeine withdrawal. As understanding of the different types of headaches has evolved, researchers have altered some of their beliefs about migraine and tension headaches and the relationship between the two. This is largely because of the realization that some headaches don't neatly fit either category. "Mixed" headaches have characteristics of both types, and because they're hard to classify, treatment can be challenging. For instance, the more intense a tension headache gets, the more it resembles the sharp, throbbing pain of a migraine headache. Likewise, when a migraine headache becomes more frequent, its pain begins to feel like that of a tension headache. Symptoms of headaches fall along a continuum ordered by their characteristics: the occasional tension headache is at one end and the migraine headache is at the other. In between are chronic daily headaches, which can start with features typical of either tension or migraine headache. 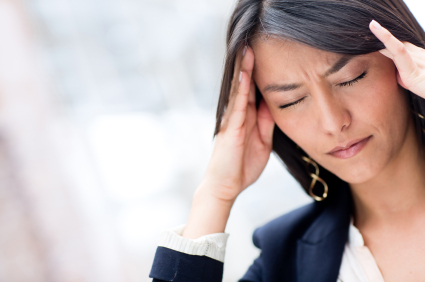 Some headaches are actually symptoms of another health problem. Many non-life-threatening medical conditions, such as a head cold, the flu, or a sinus infection, can cause headache. Some less common but serious causes include bleeding, infection, or a tumor. A headache can also be the only warning signal of high blood pressure (hypertension). In addition, certain medications — such as nitroglycerin, prescribed for a heart condition, and estrogen, prescribed for menopausal symptoms — are notorious causes of headache. headache that interferes with routine activities. Always take children who have recurring headaches to the doctor, especially when the pain occurs at night or is present when the child wakes in the morning. Mild to moderate steady pain throughout the head, but commonly felt across the forehead or in the back of the head. Generally not accompanied by other symptoms. Can affect children, but is most common in adults. Frequency varies. Generally hours in length. Mild to moderate steady pain that typically occurs in the face, at the bridge of the nose, or in the cheeks. May be accompanied by nasal congestion and postnasal drip. Affects people of all ages. People with allergies seem most vulnerable. Frequency varies. Generally hours in length. Often seasonal. Moderate to severe throbbing pain, often accompanied by nausea and sensitivity to light and sound. The pain may be localized to the temple, eye, or back of the head, often on one side only. In migraine with aura, visual disturbance precedes the pain. Typically occurs from childhood to middle age. In children, migraine is slightly more common among males, but after puberty, it's much more common in females. Attacks last a day or longer. They tend to occur less often during pregnancy and with advancing age.